Okay, so somehow between yesterday and today, working both days, rounding out seven days in a row, and trying to readjust to a new sleep schedule, I managed to binge watch The Devil Is A Part-timer! It was a lot of fun. I really like the characters and how they each adapted to life in Japan. The humor was good and mostly universal. I thought the introduction of Suzono and the a archangel kind of weighed down the story towards the end, but I understand that they needed a nemesis for a final showdown, and at that point in the story it wasn't going to be Emi vs. Sadaou. I watched the English dub as I'm still new to anime and I want to focus on the story and characters instead of trying to read subtitles really fast. Some things didn't seem to pan out, like Emi's stash of celestial force juice, I thought that would play a bigger part at some point. But overall the series was very enjoyable. Just sad there isn't a season two, but they ended the series on a near perfect note in the post credits sequence. I'm glad to hear you enjoyed it so much, bungo. I'm sometimes reluctant to recommend anime comedies since the sense of humor can be odd at first, but I agree that the humor here has a really broad appeal. The source material (a series of light novels, which are sorta like the YA demographic in American publishing) is still ongoing so there might be a second season one day. Some people get really uptight about dubs vs subs but I watch a pretty broad range of both. The industry has come a long way when it comes to streaming new shows simultaneously with their TV premieres in Japan, so those are rarely dubbed, but there are plenty of great dubs out there. Most of the time it comes down to personal preference IMO. I hope you get a couple days off after that many in a row! And best of luck with the sleep cycle; lord knows that's a never-ending struggle for me. Lemme know if you watch any more anime, comedy or otherwise; I'd love to hear your thoughts on it! I am off Thursday and Friday. Thank goodness, I am exhausted. I mostly wrote this before leaving, so I thought.. perhaps I should get around to posting it. Eldorion wrote: Well yeah, I don't think any relationship involving Azula is going to have a healthy dynamic. But Ty Lee certainly has got her own issues so I can see the basis for an attraction to Azula, especially her individuality and compared to Ty Lee's fear of blending in to the point of invisibility. Ever since it was pointed out to me, I've been a little uncomfortable with Ty Lee's arc ending with her joining the Kyoshi Warriors, who do basically the same thing that her sisters were forced to do growing up (dressing identically as a "matched set"). One could argue that maybe Ty Lee had become confident in herself to be able to do this, but I don't think enough time was spent on her (since she's a supporting character, after all) to come to that conclusion with confidence. So I dunno, I think both Azula and Ty Lee have stuff to work through at the end of the series, though certainly much more so for Azula. Well, that's settled then. Should we set them up on a date? It's interesting you should mention the Ty Lee ending. I read this recently which I found pretty interesting as for looking into Zuko and Azula and were the show left them. And how well thought out it all was. Ty Lees ending, as you say, feels almost out of character in comparison. Unless they wanted us to believe she had accepted her faults and failings at that point, and somehow left them behind. It felt a bit like they just wanted to tie up the storyline, and how was less important. Indecision, procrastination.. Shame those qualities aren't higher valued, as I seem uncommonly good at them. I'm not sure how fair a comparison it is, as Game of Thrones went straight of the rails in season 5, (perhaps comparing it with the books would be fairer, as some would say they have gone of the rails too?) and you can discuss what competition there actually is out there. What Avatar does though is simply in a not overlong amount of time tell a mapped out straight forward epic fantasy story that is cohesive, and, while one might nitpick small points in execution, stays on the path it started on. In many ways it parallels the Lord of the Rings books. The whole thing abut “if JRR Tolkien could wrap up the best epic fantasy story in three volumes no one else has reason not to..” thing. Well, Avatar did. feel torn about The Beach. When I first watched it (during Book 3's premiere) I hated it since I wanted more plot movement and action from the show at that point. Over time I've come to appreciate Book 3 a lot more in general, but I'm still unsure about The Beach. It's very ... '80s teen movie. To be fair, a lot of Avatar episodes are in part tributes to kinds of stories that at first blush wouldn't seem to fit with the rest of the show. Hell, just a few episodes before The Beach was The Headband, aka "Avatar does Footloose", and I love that episode! I think the main thing that still throws me about The Beach is Azula's characterization in it. I think it was worthwhile for the show to give us a glimpse of her more vulnerable side and try to humanize her, but having her open up to Zuko just seemed too at odds with her character in the rest of the show. But I haven't watched it in a long time and I might think differently nowadays. Hm, that's an interesting point. Azula's characterization in that episode definitely departs a bit from how she generally appear in the series. Although I think that is kind of the important part too. That it takes you behind the facade. I think it's good to show of that antagonists aren't necessarily monsters, or not complete monsters anyway. I guess it just puts the characters in a situation where it makes sense to act like normal teenagers and shows another side of them. I don't know. I like it as an episode, but as part of the series I can see your problems with it. I guess the question for me would be, would the Azula of The Beach have the breakdown at the end of the series? Would the loss of identity be that crushing for that person? Although, I'm not sure I like decrying the more quiet character centred moments too much, even when they feel a bit off, as I feel the characters and their relationships and interaction generally adds so much depth and emotional resonance to the story. That's really great. Not generally a fan of mixing 2D and 3D animation but that worked really well. The Joe Hisaishi music makes it something really special. I'm glad to see Castle of Cagliostro representing too! Is that from the actual documentary or is it from the same fake subtitle version as "Anime was a mistake. It's nothing but trash"? Either way, Miyazaki (or whoever wrote those subtitles) definitely has a point about over-sexualization and about pandering to some of the creepier segments of otaku. I miss anime like this. I've never watched all of Ranma 1/2 due to the length, but it's pretty funny. I know a couple people who are really into it. I think my favorite Rumiko Takahashi adaptation is probably Urusei Yatsura, though she didn't like the direction the anime started to go in. NB the song in this trailer (for the second UY movie) is also used as the end credits song and I really love it. That '80s sweetness. Speaking of '80s romance anime, I've been really meaning to get into Kimagure Orange Road for some time. I watched a few episodes as a sampler on a previous '80s binge but I'd like to give it the attention it deserves some day. Aang: So, Toph thinks you give pretty good advice, and great tea! Iroh: The key to both is proper aging. What's on your mind? Aang: Well, I met with this guru who was supposed to help me master the Avatar State and control this great power, but to do it, I had to let go of someone I love. [He and Iroh stop.] And I just couldn't. Iroh: Perfection and power are overrated. I think you were very wise to choose happiness and love. Aang: [Earthbends again.] What happens if we can't save anyone and beat Azula? Without the Avatar State, what if I'm not powerful enough? Iroh: I don't know the answer. Sometimes, life is like this dark tunnel. You can't always see the light at the end of the tunnel, but if you just keep moving, [Aang earthbends the rocks away one last time. Iroh's fire blows out. He smiles.] you will come to a better place. Btw, I just started watching Cowboy Bebop, (kind of going through your list, Eldo) which, while it's no Firefly and certainly no Avatar, the writing is a bit to inconsistent for that, is really cool. I'm liking it a lot. People say that about Iroh? I've actually only talked to one other ATLA fan who had anything negative to say about Iroh, though that was more to do with his relationship with Azula (which was an interesting point I had never considered before, although I don't think I entirely agree). I'm glad to hear that you're enjoying Cowboy Bebop. It's been ages since I've watched it so the episodes I like surely stand out more in my memory. I do recall a couple in the second half that I really didn't care for. Not sure what exactly you mean by inconsistent writing though like I said my memories are a little fuzzy. All in all though I'd probably rank it above Avatar if I were to put Avatar on my favorite anime list, though it'd be tight. Interestingly, both shows have to deal with elements of their fandom who promote the shows as the pinnacle of human artistic achievement, which doesn't do either of them any favors. I haven't seen Firefly so I can't comment on the comparison between them (I did see Serenity and wasn't too impressed but I wouldn't want to judge the whole series just from the movie). Bebop has one of my all-time favorite soundtracks for sure, though. I should probably reflect on it further when I've finished the show though. And all that said, I do like it a lot. Eldorion wrote: I haven't seen Firefly so I can't comment on the comparison between them (I did see Serenity and wasn't too impressed but I wouldn't want to judge the whole series just from the movie). Serenity was a bit meh. Firefly is amazing. Although a bit of the praise probably ties in with how much promise it left. I think as Nathan Fillion said, it never had the chance to disappoint, or have a mediocre second season or whatever. Eldorion wrote: Bebop has one of my all-time favorite soundtracks for sure, though. I'm liking the addition of Ed. I feel he adds a fair bit to the group dynamics. While I in no way mind them having a dog, I'm not sure he's contributed all that so far. Then again, he is a dog. Eldorion wrote: People say that about Iroh? I've actually only talked to one other ATLA fan who had anything negative to say about Iroh, though that was more to do with his relationship with Azula (which was an interesting point I had never considered before, although I don't think I entirely agree). Sorry, took me a little while to track this down. But anyway I was mostly going off this. Although, it is said in jest. I guess I just figured it was a wider held opinion. I never noticed it much myself, having always loved Iroh as a character. Although I admittedly I paid a fair bit less attention to LoK than TLA, which this kind of is a comment on. Eh, I was pretty unimpressed with Iroh's appearance in The Legend of Korra myself. Felt like really cheap and obvious pandering. I don't remember too much of what he actually said though. But I gotta be honest, I mentally block out most of Korra and the comics when I think about Avatar. Once upon a time, in New York City in 1941... at this club open to all comers to play, night after night, at a club named "Minton's Play House" in Harlem, they play jazz sessions competing with each other. Young jazz men with a new sense are gathering. At last they created a new genre itself. They are sick and tired of the conventional fixed style jazz. They're eager to play jazz more freely as they wish then... in 2071 in the universe... The bounty hunters, who are gathering in the spaceship "BEBOP", will play freely without fear of risky things. they must create new dreams and films by breaking traditional styles. 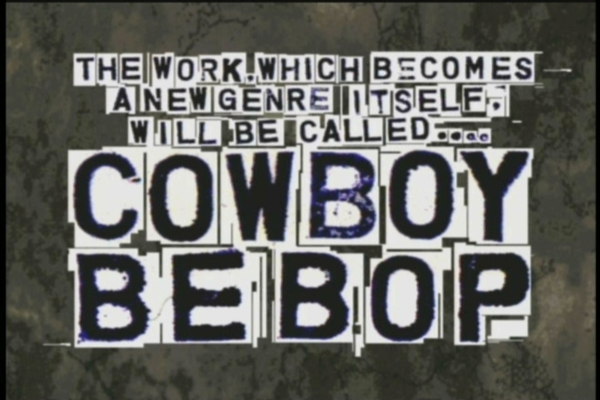 The The work, which becomes a new genre itself, will be called... "COWBOY BEBOP"
Knowing a little more about the backstory to the show's production sheds some more light on this. It's technically the director, Watanabe's, second work. But his first was an OVA (direct to DVD, without the stigma) miniseries called Macross Plus that was the 10th anniversary project of a very famous and influential series, and the original creator of Macross was also heavily influenced in the show. So I believe that Bebop gave Watanabe and lead writer Keiko Nobumoto*, who had also worked on Macross Plus, a much greater level of creative freedom. I'm not trying to give you a hard time about Bebop so I hope I'm not coming off that way, and I'm glad you're enjoying it. Just wanted to bring this up since, as you know, I love talking about shows I like (as well as the sound of my own voice ). Bluebottle wrote: I'm liking the addition of Ed. I feel he adds a fair bit to the group dynamics. While I in no way mind them having a dog, I'm not sure he's contributed all that so far. Then again, he is a dog. *A close reading of the credits will show that the original concept is credited to Hajime Yatate, which is a collective pseudonym used by Sunrise Studios, which produced the show. I can't get over the Ranma 1/2's soundtrack. I marathoned that show recently (took a while) and it makes me sort of sad that there are no more episodes to watch. I think Shampoo is my favorite character. Eldorion wrote: I'm not trying to give you a hard time about Bebop so I hope I'm not coming off that way, and I'm glad you're enjoying it. Just wanted to bring this up since, as you know, I love talking about shows I like (as well as the sound of my own voice ). Oh, nono. I only posted about it because I felt it would be interesting to get someone else's perspective on it. Thanks for taking the time to respond. It's interesting to hear that some of the things I've noted about the show actually were intentional, and part of what they were trying to achieve. In that context perhaps it in the end comes down to preferences. Although I should probably keep an open mind, seeing as the two last shows I got majorly into, Firefly and Avatar, were more concerted efforts. It might just as much be the shock of something different, and it might just take some time getting used to. Hmm, I think the only thing to do might be for you to watch Firefly and for us then to compare notes. Well, I guess I just expected a bit more when they introduced this robot dog. So far he barks at things, and I think answered the phone once. Although, that's not to bad for a dog all in all. Perhaps I shouldn't complain. Recoveryanonymous wrote: I can't get over the Ranma 1/2's soundtrack. I know that feeling. I often feel a little down after finishing reading/watching (or re-reading/re-watching) something I really like from start to finish. Though with anime, the fandom being oriented more towards the medium as a whole than to specific works (at least the circles of fandom I move in) makes it easier to jump into something new shortly thereafter. At least for me. Bluebottle wrote: Oh, nono. I only posted about it because I felt it would be interesting to get someone else's perspective on it. Thanks for taking the time to respond. It's interesting to hear that some of the things I've noted about the show actually were intentional, and part of what they were trying to achieve. In that context perhaps it in the end comes down to preferences. Although I should probably keep an open mind, seeing as the two last shows I got majorly into, Firefly and Avatar, were more concerted efforts. It might just as much be the shock of something different, and it might just take some time getting used to. Out of curiosity, how far in are you? I adored the first episode of Bebop and found its ending to be quite haunting, but after that it took me about five or six episodes to get fully into it. Re-watches have brought me greater appreciation of the show as well. But it is kinda unusual, including by anime standards. I hope you'll keep us posted on your progress through it! NB Ein does have a few good moments later on, but he's still a dog. Just a fairly smart one. I'm at about episode 20 now, but was at about 14-15 when I wrote the first comment on it. I am getting more into the feel of it as the show progresses. Although it's odd to think I'm nearing the end. Eldorion wrote: I'll think about it. I'm thinking as hard as I can! 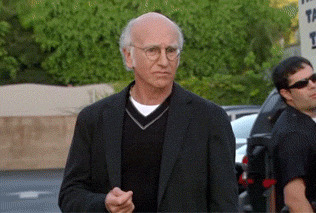 Like I mentioned earlier some of the episodes I wasn't so hot on are in the last third or so of the show, but the finale is one of the highlights. The movie is also fantastic, though in a way it's just an extra long stand-alone episode (set at a vaguely specific time during the course of the series).